Sandy, 70, from Stirling has been volunteering with our Handyperson Project for the past 10 years. The project runs in Stirling and Clackmannanshire, involving volunteers who complete small maintenance jobs for older people. Some older people struggle to complete these jobs at home by themselves and it can be expensive or challenging to hire a professional to do such a small job. Our service means older people stay independent and are at less risk of an accident at home. 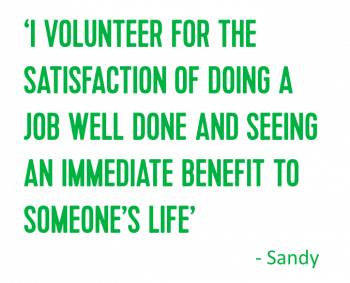 We caught up with Sandy to hear about a recent job he completed, and he told us what a day in the life of a volunteer handyperson looks like! A recent case came to me as a request from the local volunteer organiser who supplied a name, address, contact number and job details. A client had called in to ask for help with a curtain, a blown light bulb and some flat pack building. First I have to consider if this sounds like a job I can do and if I can tackle it on my own. Maybe it involves shifting furniture or a lot of flat pack, so two people are an advantage. Personally I try to avoid small plumbing repairs. This one I think I can cope with on my own so I wait until I know when I can find time and make the call. In this case the lady was going to be in at my preferred time. I always ask if there are stepladders there and things like spare bulbs. Again this was OK. So in the afternoon I packed my job bag, drill and tool box in the car ready to go. Steps not needed. I should say that if the job is nearby and only needs selected tools I will go on my push bike. The main light bulb in the sitting room had gone. Easy, but at first it looked like the available bulb was too large for the fitting – it was OK. What wasn’t ok was the ceiling fan part of the light fitting. The light fitting, fan and bulb had been left on when the bulb went. However the fan motor was jamming as it was on its lowest setting and the whole fitting was very hot. With the fan switched off it cooled down and the client said they would get it checked before it was used again. Maybe the volunteer service had prevented a fire? There were two flat packs. First a shelf unit which was fairly easy but I decided to assemble only 3 of the 4 shelves to fit the available space better. The second was a more complicated shelf unit with back, 5 shelves and front doors. Despite poor instructions this was assembled OK but as with all self-assembly units they take a fair amount of time. We have to ask about smoke and CO2 alarms (where gas is installed). In this case all present and correct. As we work away we look out for fire and trip hazards. In this case I recommended that a single socket with three 4 socket extensions and a new electric fire on the way was a bad case of overloading and the client is going to connect the fire in a different socket. Then there were a few very loose mats with turned up edges around the place which are not ideal for older unsteady people. We do usually get offered a cup of tea and sometimes homemade cakes. We always say never ask anything else as there often are several other problems – but we always do ask! In this case there were none. People ask how much? Anything I have to buy or supply is paid for by the customer but other than that the service is free. Most people however are pretty generous and in this case I got a reasonable donation for Volunteering Matters. Back home I file the donation away to be handed in later, text the job organiser, fill in a job report and email it to the office.